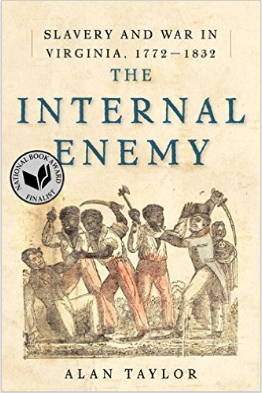 Alan Taylor’s The Internal Enemy: Slavery and War in Virginia, 1772-1832 addresses the paradoxical and complex subject of slavery in a state dedicated to the ideals of liberty and freedom, yet that still enslaved two-fifths of their population. As the book’s title suggests, white Virginians viewed their enslaved populations as an “internal enemy,” who were enticed by the British to run away from their masters and mount an armed rebellion against them during the American Revolution. Therefore, when the British returned to the Chesapeake during the War of 1812, invading plantations and freeing slaves, Virginians faced another wave of fear of this “internal enemy” that further deepened the state’s commitment to slavery in the early decades of the 19th century. While the majority of the book looks beyond the period of the American Revolution to the War of 1812, the following excerpt sets Lord Dunmore’s 1775 proclamation as the precedent to British actions nearly 40 years later.